And if you haven’t figured it all out by now, the “friend” is actually me. I know I probably had you all fooled, but yes…time to fess up – – this story is autobiographical! A page taken directly from my personal diary! So I’m still doing my thing at Wendy’s, but soon after I posted this, the workers changed a bit, so it was almost like I started going to a new restaurant. At least for the first week… Then, I became a regular again – you know, Norm at Cheers, but instead of my place being a bar, my place is the drive-thru at Wendy’s! Well…of course this wasn’t necessary, because I knew that my lunch would cost me exactly $4.64. It costs me the same every single time I go to Wendy’s because I get the same thing every time. Wendy’s Lady: That will be $4.64, but it’s not like I needed to tell you. You knew already, right? Me: Yep. Price hasn’t changed much. Wendy’s Lady: I’m sure I’ve told you about our survey before on the bottom of your receipt. If you take the survey online, you will get a coupon for 1/2 off a second sandwich. So if you wanted to try something new here for a change, you could get it for 1/2 price. Of course, you could also just get two cheeseburgers if you prefer to do that. Wendy’s Lady: Have a nice day. See you tomorrow, maybe! As I pulled away, I felt like I was being judged. Hmmmm…maybe it’s time for me to try going to another Wendy’s. According to a Google search, there is one just north of me, and another one just east of me. If I rotate between the three Wendy’s, they might never get to know my routine. Probably never would’ve thought about this blog post if I hadn’t had my Sonic incident earlier this week as well. I think the two of them together in the same week caused me to question my addiction to fast-food! At Sonic, my best buddy is Dylan. He is almost always my carhop when I’m there in the mornings (and the afternoons)! He is very cheery and comes out at each of my visits smiling and says “How are we today?” Don’t misunderstand – there’s no “we,” it’s always just me. That’s just Dylan’s thing I guess. One day earlier this week, my husband was “working” from home, so when I went on my usual morning Sonic run, I ordered him a Diet Coke as well. Dylan came out like always but instead of his usual line, he said “Wait a minute. You’re throwing me off my game. You must be really thirsty this morning. Two Diet Cokes?” I quickly told him that only one was for me and the other was for my husband. As I drove off, I wondered why I felt like I had to explain myself to my carhop? This fast food story is about my “friend,” and it’s so funny that I really wanted to share it with all of you. She gave me permission to do so, because my “friend” knows she is not the only one out there with this kind of story. So here goes…and remember…this story is about my friend (who shall remain nameless). For the rest of this story, I will be referring to my friend as “I” and “me” just so it doesn’t get too confusing. Okay? It will start to sound like a story about me, but just remember…I am writing about a friend! Today, after running countless errands catching up from taking Spring Break week off, I decided to drive through Wendy’s (again) to pick up a Dave’s Single with cheese (no onions) for lunch. I didn’t have a lot of time before carpool, so a cheeseburger from the drive-thru was my best and fastest option. Here’s where the humiliation part begins. I pulled up to the drive-thru, and I placed my order. The total, like always, was $4.32. Yes…I know the total before they even tell me, because I get the same thing every time I go to Wendy’s! I pulled around to the second window, and the nice young man took my money, gave me my change, and then a nice lady approached the window. She leaned out and began talking to me. What she said, made me realize that it might be time to shake things up a bit. Wendy’s Lady: Hi! How are you? We missed you last week. My Friend: Oh yeah…last week was our Spring Break. We were out of town for a few days. Wendy’s Lady: Well, we’re glad you’re back. Listen…I want you to keep up with your receipt. When you get home, you need to log on to this website. There is a survey that takes about 30 seconds. After you fill it out, Wendy’s will send you a coupon for $2.00 off of any large sandwiches or salad on the menu, and your sandwich that you always order qualifies as a large sandwich. My Friend: How nice. Thank you. Wendy’s Lady: Since you’re here so much, you might as well take advantage of this system. I’m not sure how many times you can take the survey, but $2.00 off is a pretty good deal. My Friend: It is. Thanks for letting me know. Wendy’s Lady: You’re welcome. See you tomorrow (as she laughed)! I drove off thinking how pathetic this story was going to sound when I told my husband! I wasn’t sure what his reaction would be. So I headed towards Sonic as I thought about what had just happened, you know, to get a large Diet Coke (another part of my routine), because we all know that Wendy’s doesn’t have the best diet Cokes. I pulled in to Sonic, pressed the little red button, placed my order, and I waited for my drink. And wouldn’t you know it, the young man bringing my diet Coke to me, walks up to the window and says “Hey…you’re back! You sure drank that first diet Coke fast.” I just smiled and drove off thinking that I needed to Google all the Sonic and Wendy’s locations so I can mix it up a bit… I decided that if I have 3-4 different locations, I can spread out my visits so no one figures out my routine so easily! You might be surprised to learn that a cheeseburger (Dave’s Single with cheese in my case) is 570 calories. I know, I know…that is a lot of calories for lunch, but I usually only get a cheeseburger on days that I exercise, so it all balances out, right? And…I don’t ever get the french fries or their yummy frosty. I’ve been tempted a few times, but I don’t let myself get into that habit. The cheeseburger for lunch is bad enough. I’m always surprised by how many calories their salads are. I always consider getting one, because it seems like a much healthier choice. It might be, but it certainly doesn’t taste better than my cheeseburger. 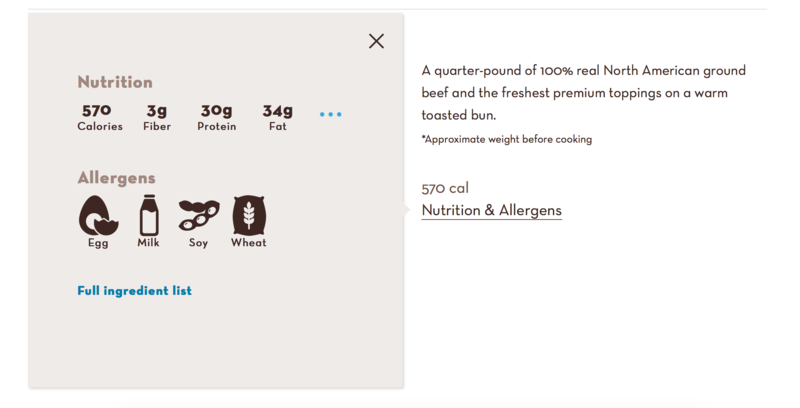 And you might be surprised by some of the information I discovered while looking up the calorie count for my cheeseburger. 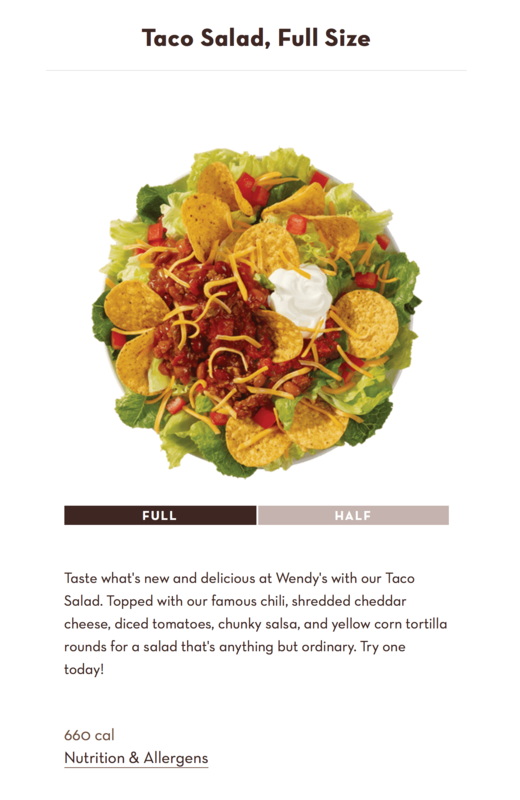 Wendy’s offers several salads, one of which is their Taco Salad! Guess what, it might sound healthier than a cheeseburger, but it has a whopping 670 calories! Look at the picture below…I’m not making this up. And that’s not the worst of them. Their Apple Pecan Chicken Salad has 570 calories, and their Spicy Caesar Chicken Salad has 720 calories! Wow! For 720 calories, you could probably have my Dave’s Single with cheese and a handful of French fries! Also, the people who worked at Subway came to know me quite well, and I got tired of them knowing exactly what I wanted before I even set foot in the store. I felt like we were getting a little too close. So I tried to change it up a bit by going to Wendy’s instead. Well, look where that got me! It got me a 570 calorie cheeseburger for lunch instead of a nice, healthy turkey and cheese sandwich. However, the problem with Subway was that I always got the “meal deal.” Guess what comes with the “meal deal”?? You guessed it – yummy chips! Just what I didn’t need. The turkey sandwich that I got each time I visited Subway is about 280 calories! Quite a bit less than my Dave’s Single with cheese. Since I am unable to pass up the chips though, it’s sort of a toss-up. The chips are about 200 calories per pack. So what’s a girl to do? Go for the 570 calorie cheeseburger, or the almost 500 calories that includes a yummy sandwich AND chips? I think I have a solution… Like my title said, it’s time to shake things up a bit. How about a cheeseburger on days that I exercise, and visit Subway on days that I don’t (just don’t get the chips). That way, neither one of the stores will be able to laugh at me and say “See you tomorrow.” With 2 fast food restaurants to choose from, they will never know if I’ll be there or not. I know, the guys at Sonic will always know to expect me (at least once per day), and that will not change. But I can certainly shake things up a bit by alternating between the two restaurants, right? And what if I got really crazy and threw in a third restaurant? Maybe add Jason’s and/or Panera to the mix? Oh my…it’s getting crazy up in here. For now, I’ll stick with Wendy’s and Subway, and maybe one of these days, I’ll try eating lunch at home. Nah…probably not.